Is your toddler always on the move? Climbing on the furniture, crawling under the table, or trying to reach the top of “mount laundry” — or is that just mine? Building an environment where your toddler has room to explore their abilities and try new things is vital, and the best toddler climbing toys can help with that (source). Being a mom to an active toddler, finding a toy where they could burn some energy was a gift from above. Given that they also promote strength, hand-eye coordination, and more, we were intrigued by the idea of a climbing toy. Don’t worry, you don’t need a big backyard to have one — many can easily fit indoors, depending on your space and setup. Let’s take a look some of the features these toys offer, then go over our favorite picks. Use the links above to check the latest prices or read our in-depth toddler climbing toy reviews below. Climbing toys come in all shapes and sizes — there are large options for outdoors, and smaller compact ones for indoors. Which features you opt for depends on your house, your toddler, and yourself. Multi-purpose: This is a feature I always look for. Perhaps find a climbing toy with a tunnel, a slide, or a basketball hoop — different activities that your toddler can explore. If they show interest in swinging, for example, maybe that’s a feature you’d like to include. Timeless toy: Choose something that will grow with your child. A climbing toy that applies to a wider age group that will last a while is always a better purchase than something that won’t get any use after a year. 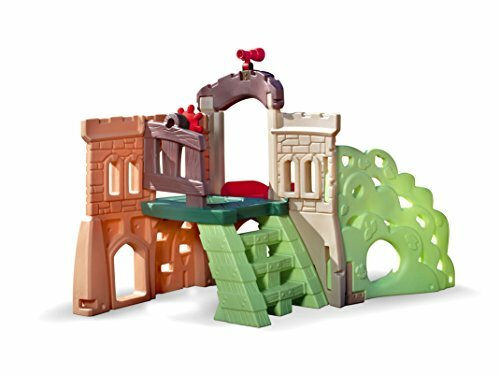 Encourage learning: Consider a climbing toy that encourages your toddler to explore, learn letters or numbers. These extra features can go a long way in keeping them entertained while being educational. Climbing toys are perfect for developing all sorts of new skills. 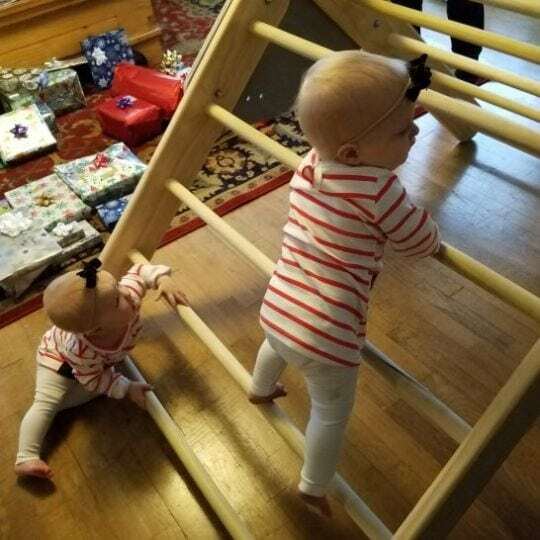 Some may even learn to climb before they walk! When it comes to toys, safety is a top priority. Here are some precautions to take and what to avoid (source). Avoid sharp edges: A poke in the eye, a scratch on the arm — either way, avoid anything that could potentially cause injury, and instead look for products with rounded edges. Age appropriate: If your toddler is small, avoid buying something designed for older children, which will only frustrate them and potentially be dangerous. No choking hazards: If there are ropes or hanging parts, make sure a toddler can’t get caught or wrap it around their neck. Now that you know the main things to consider when looking for a climbing toy, let’s get down to business with our top choices. Whether you have a large expansive living room or are limited for space, there’s something on the list for you. This set from Children’s Factory is perfect for creative toddlers and younger babies from ages nine months to three years. What your toddler will love the most is that they can pull the Velcro blocks apart and arrange them as they please. The blocks are soft and colorful, and easy to wipe clean. 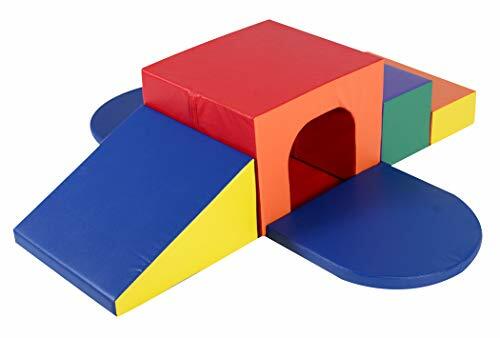 In this set, you’ll get a tunnel, a staircase, a slide, and a floor mat. 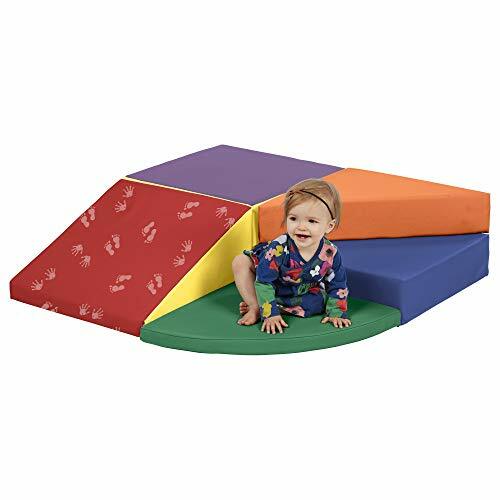 Perfect for tumbling, crawling, and climbing. Thanks to Eezy Peezy, we can now have monkey bars indoors too, so long as we have an open space to set it up and break it down again. 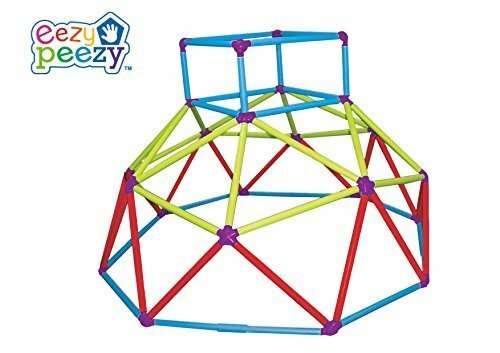 This climbing toy is basically a dome full of bars. The construction is light, easy to assemble, with secure self-locking springs, and can carry up to 150 pounds. The “wow” factor of it all is the bright color. However, it’s fair to mention that this is for those who already have some experience with climbing. Suitable for children up to six years of age. Bring the outdoors inside with the Woodland climber, which features two climbing walls, steps, and a slide. There’s also a small deck, with two steering wheels to navigate the forest. It’s suitable for children from two to eight years. With a maximum weight capacity of 240 pounds, mom can have a go as well. This toy can also be used outdoors, though you might need someone to help carry it, at just over 80 pounds. Once outdoors you can transform the bottom portion into a sandbox. While indoors, that same section can be used for storage, or as a hideout. 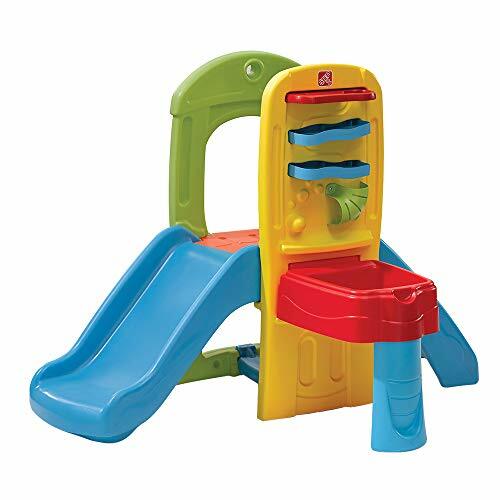 This slide and climber from Little Tykes is a compact package and a great option for beginners. Your toddler can navigate the 12.5-inch climbing wall, which leads up to the top of the slide, plus there’s a hideout underneath for them to crawl through. Because of its small size, it’s not too intimidating. However, it will only carry up to 45 pounds at a time. Suitable for toddlers from 12 months old. Toddlers love to climb and crawl. And with this colorful tunnel, they can do both. 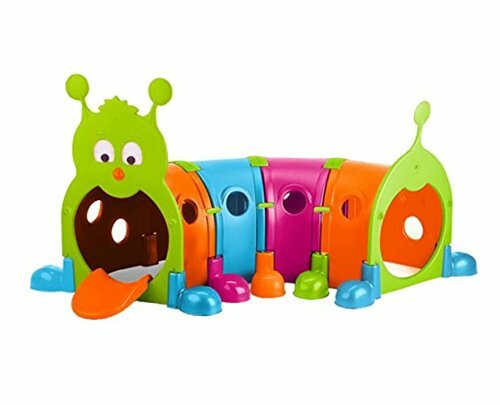 This climbing toy is a large caterpillar where your toddler can crawl through its mouth into the tunnel. What we love about this unit is that the pieces can be arranged and rearranged to keep your kids interested in building as well as having fun with patterns. Then, once your explorers feel ready, they can climb to the top and ride the caterpillar. In apartments, we rarely have room to spare, but you can remove tunnel sections to save space. It’s recommended for children from 3 to 8 years. I love toys that you can easily place in a corner — they take up less space that way. This soft foam building block set might be just what you’re looking for. Your toddler can construct their own climbing fort. The pieces stick together with Velcro and there’s a textured base underneath, to keep them from sliding around. The material is leather-like, non-toxic polyurethane, which is super easy to clean and soft for the smallest of users. Ball games are usually considered an outdoor activity. However, when there’s a target it’s easier to contain. Not to mention when the weather is bad, kids tend to get a little cooped up so playing ball could help release some energy. 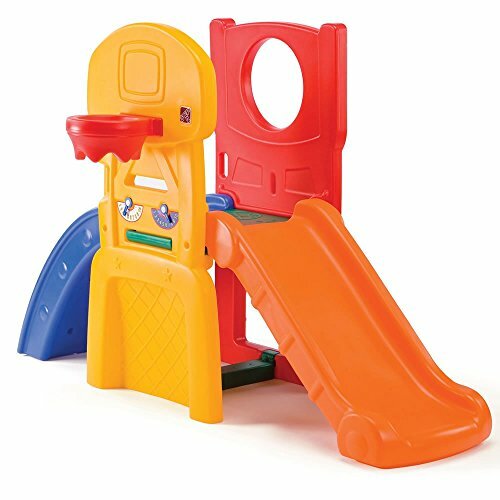 This climb and slide from Step2 is five activities in one. There’s room to climb to the top and slide down. Then on the ground, your toddler can play either football, soccer, or basketball, balls included. Your little one can even keep score with a scoreboard. At 33 pounds, it shouldn’t be too heavy to shift to another location. If you thought monkey bars were for outdoors only, think again! Lil’ Monkey’s Everest Climb is perfect for indoors. The entire set is easy to assemble and take apart again; it simply folds up and slides under the bed. We especially love this because it’s so simple, yet full of potential. Your toddler can climb, duck, and slide. You can also take it outside during the summer. The material is UV-resistant and waterproof. Suitable for younger and older toddlers alike. 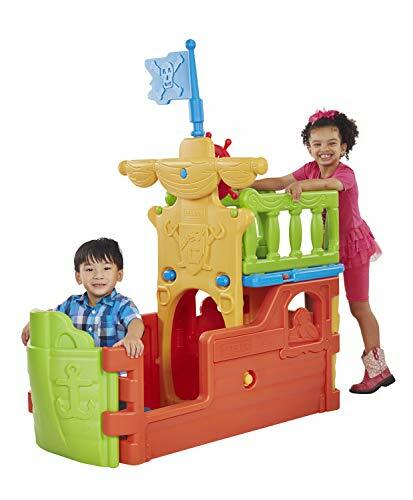 Now your toddler can live out the pirate dream and explore the seven seas with this uniquely-designed indoor pirate ship. It’s ideal for toddlers who love to steer the ship. Here they can climb onboard and turn the wheel, or crawl under the deck. Besides the pirate theme, the colors are bright and toddler-friendly. It doesn’t take up too much floor space, at only 4.5 feet long by 2.5 feet wide. Furthermore, it’s certified for its use of safe plastics, minimizing chemical emissions. 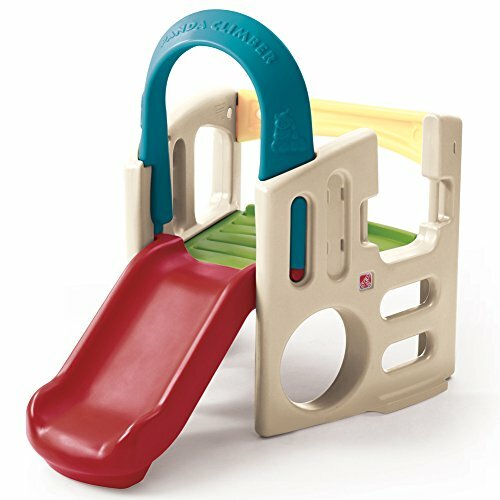 It’s never fun playing alone, but with this climber from Step2, your little one won’t have to. 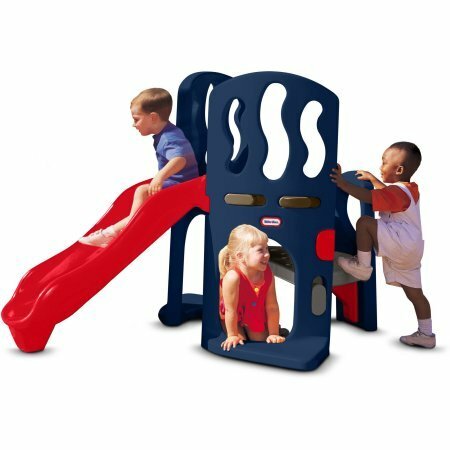 While one child is climbing and sliding, the other can play with the unique maze game located on the side of the climber. With this climber, your toddler also gets ten balls. These can fall through the zig-zag maze and into the pit. Needless to say, there’s plenty of fun to be had here. 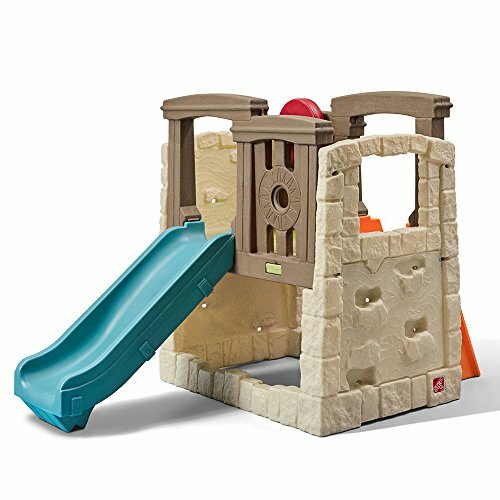 Suitable for children 18 months to 4 years, this 26-pound climber is a lightweight option. Being outdoors, breathing in fresh air, getting some sun — these are the perfect ingredients for any toddler. Here are our top 10 outdoor toddler climbing toys, from large, intricate options to smaller, simpler play areas. When choosing a toy for the backyard, it must be durable. 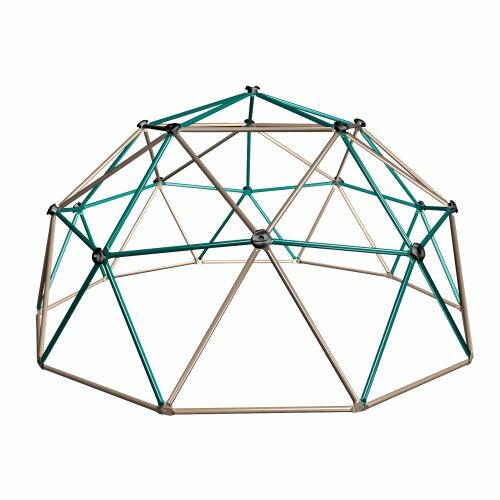 This dome climber from Easy Outdoor is both UV- and rust-resistant. It’s made from steel and can carry up to 1,000 pounds, so it can handle a bunch of wild toddlers at a time or hey, maybe even dad. 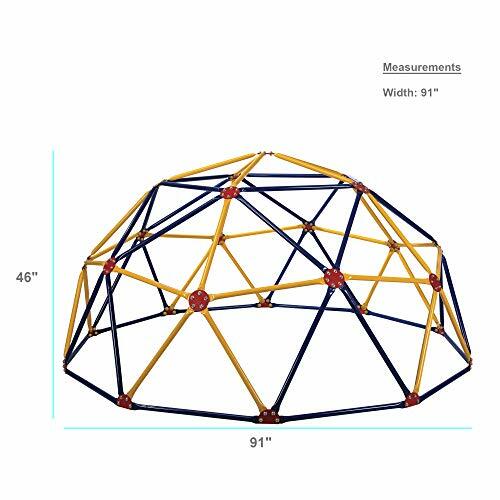 What’s great about a dome such as this one is that your child really has a chance to exercise. By climbing, hanging, and crawling through, they can also gain motor skills and confidence. Suitable up to nine years of age, you’ll have this around for a while. If your toddler loves role playing with friends, then take a look here. 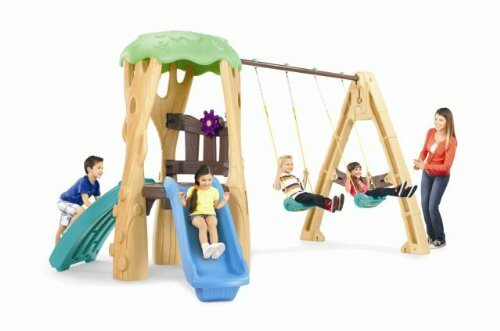 This climber and swing set from Little Tikes is everything a creative mind needs. It can carry a little over 300 pounds (at 81 pounds per child, that’s a maximum of four children at a time). This toy is so inviting, with its two swings, climbing wall, deck, and slide. The tree trunk also has a climbing unit attached. The deck is like a little tree house, where there’s a steering wheel to navigate the perimeters. Perfect for children aged 3 to 10 years. 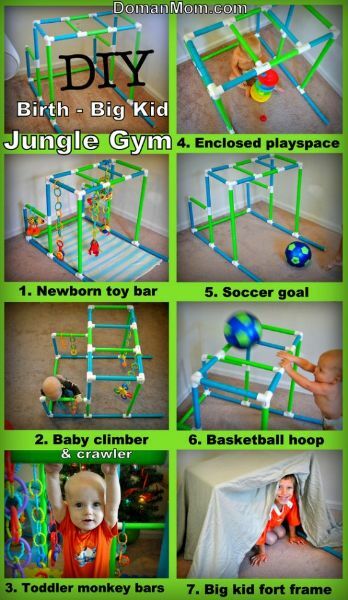 Children love jungle gyms, and this dome from Lifetime will not disappoint your toddler. This will carry up to 600 pounds and is great for children aged three to six. For smaller families or those with younger toddlers, this starter dome may be a good option. Lifetime constructed this from heavy-duty, rust and weather-resistant steel. As your little one gets accustomed to the bars, they can work their way up to the top, little by little. Just because your toddler is still on the short side, doesn’t mean they can’t enjoy reaching the top of the platform. 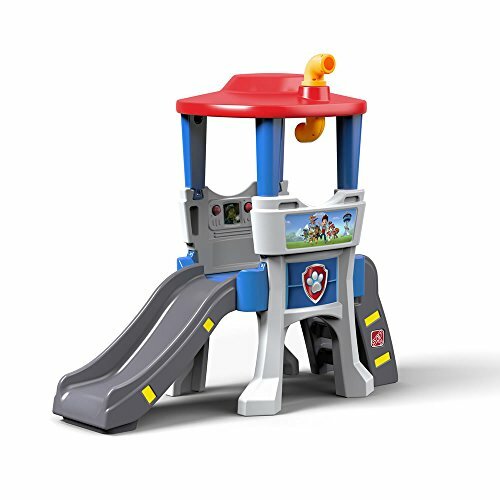 Suitable for kids starting at two years, the dual-level platform ensures that even the youngest of users can have some fun. 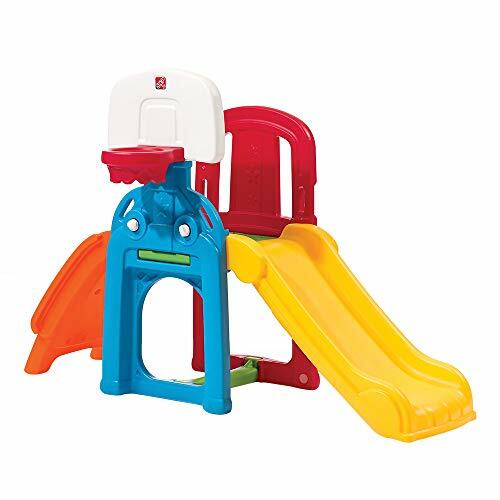 This Little Tikes climber is perfect for your toddler’s playdates — there’s room for at least three children. If you’re working with less space in your backyard, it can be difficult to find a climbing toy. 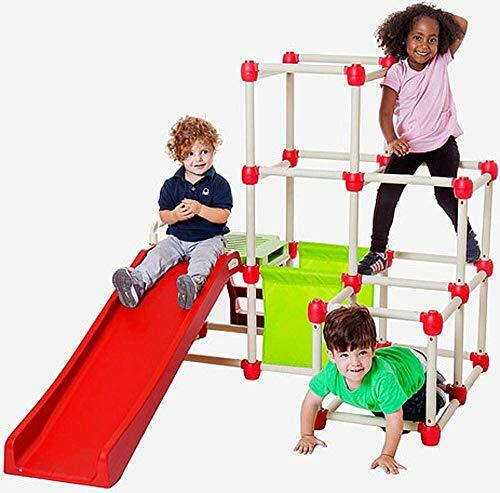 However, this multi-functional activity climber has a small footprint, weighs only 30 pounds, and is easy to assemble. There’s a climber leading up to a slide, with a basketball hoop and scoreboard on the side. The holes on each side are ideal for goal scoring practice, too. A soft ball is included for the sports activities. With a 60-pound weight limit, it’s suitable for children aged two to six years. This is a bit different than all the other climbing toys on today’s list, but it’s worth a mention. 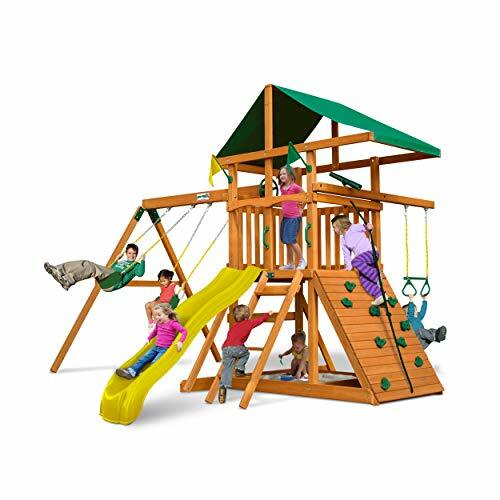 This is a complete playset with swings, a slide, sandbox, trapeze bars, and the climbing walls. It’s large and needs a fair amount of space to be kept as a permanent feature in your backyard. Your toddler can climb to the treetop house and use it as a secret hideout. When your little one doesn’t feel like climbing, they can take a turn on the swings. If you have the space, and the budget, this is a great all-in-one product suitable for ages 3 to 11 years. This climber can carry up to 60 pounds at a time and is great for children under five years. There’s a safety railing to ensure your toddler is safe once on the platform. Your toddler can climb from either side and, once at the top, there’s a small deck where they can prepare to scooch down the slide. The climber is not as tall as some of the others, so it won’t seem too intimidating, even for the smallest mountaineer. Toddlers love keeping order — when they’re not causing the trouble of course. In this climbing set, your little one can pretend they’re a part of “Paw Patrol.” It’s suitable for toddlers and children from 18 months to five years. 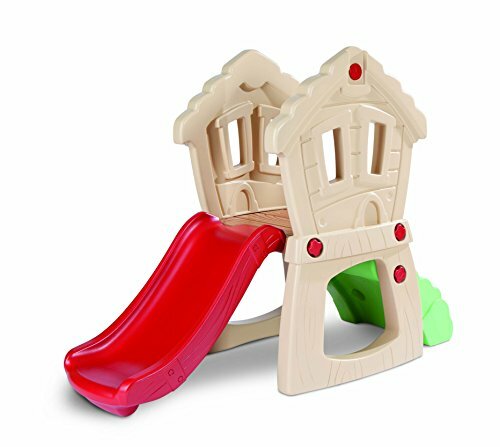 Under the roof, there’s a periscope your little one can use to spot trouble, then quickly shoot down the slide to set everything in order. 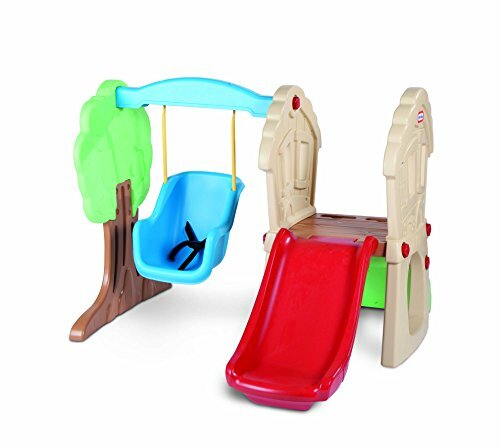 This climber and swing set from Little Tikes is excellent for little adventurers. The set is relatively small in size and easy to climb, even with shorter legs. It can carry three children with a maximum weight limit of 45 pounds per child. The swing features a three-point seatbelt, meaning a small toddler can swing in safety. Here, your toddler can climb on board while others scout the surroundings from down below. Two different climbing walls ensure there’s something for younger and older kids: one is an easier option, while the other is more challenging. Then, if bad weather approaches the perimeter, they can shelter underneath in their secret hideout. It’s an adventurous option, suitable for children from two to six years. Are you up for the challenge? Some parents would prefer to make their own, and we applaud you for that. A DIY project can be a personalized endeavor. Whether you want to practice the old handcraft skills or find an activity for your partner to conquer, here are our top five DIY options. Pikler is based on a theory from a pediatrician named Emmi Pikler. In short, she stressed the importance of letting the child develop in their own time and at their own pace (source). 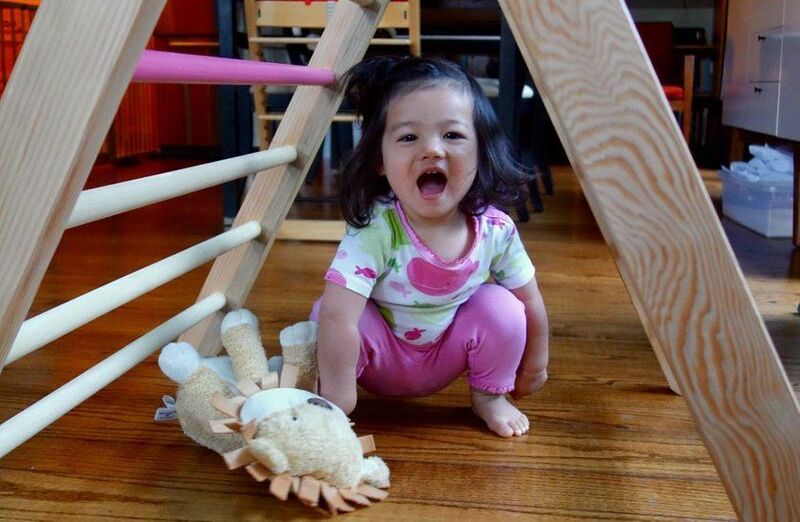 The Pikler allows your toddler to explore their abilities simplistically. The multi-level, triangular shape keeps it straightforward enough and, to store it away, simply fold it up and put it in the closet (or under the bed). As a big plus, it’s relatively easy to make, for those who have basic carpentry skills. I know my children would be through-the-roof excited for one of these impressive walls. Although it looks like a monumental task, we appreciate the clear instructions and the fact that the builders include their mistakes so we can avoid the same. Suffice to say, you’ll want to include a landing pad below, especially when your child works up the confidence to climb all the way to the top. Ever thought you could make your own jungle gym? No, me neither. But now we can, with the help of this useful guide. This is a DIY project you can sign yourself up for, even while your child is still a baby. Once it’s finished, you can use it as a baby toy bar, toddler monkey bars, a soccer goal, and much more. With all these options, it seems like a great choice. This DIY climbing wall allows for older toddlers to have an authentic climbing experience, complete with not only climbing pegs, but a rope attached to a carabiner for support. 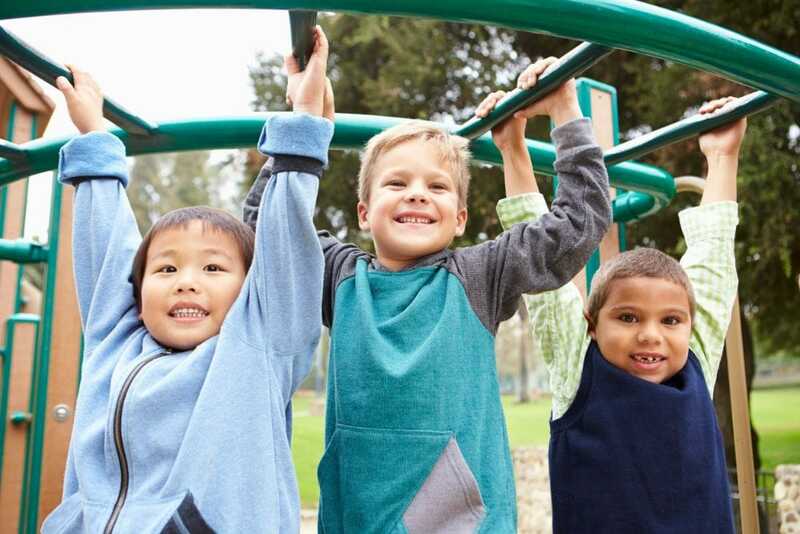 For younger children, you’ll want to ensure the rope is used properly and under supervision. I would also suggest putting a mattress on the floor, for obvious reasons! This project requires some handy skills, but I’m sure your little one will appreciate it. You can decorate it with maps and other fun stuff as you please. Since the Pikler seems to be a popular choice online, we’ve included this add-on climbing wall for your Pikler triangle. 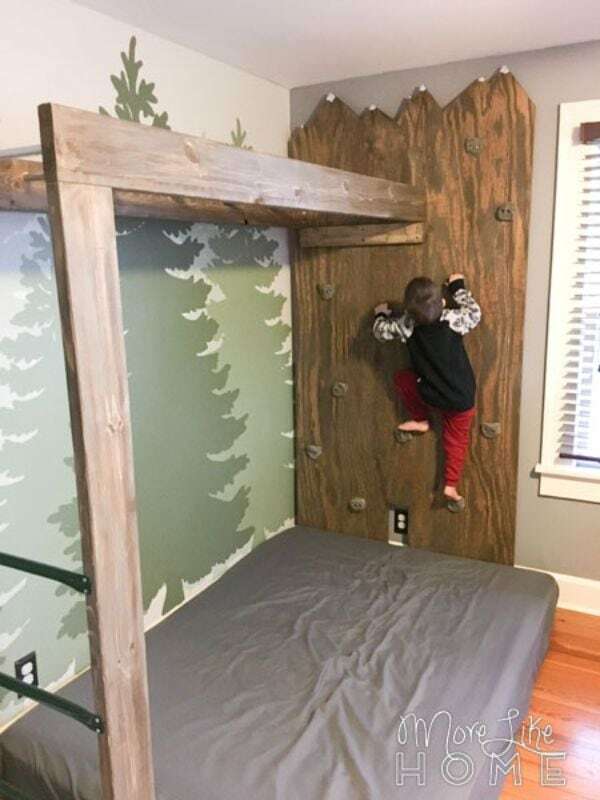 Once you build this miniature climbing wall, attach it to the Pikler with some hooks. Then your little one can climb up and down. We reckon this could be used on its own as well, attached to another safe and suitable surface. We appreciate the size and minimal carpentry skills needed. With the best toddler climbing toy, your miniature mountaineer can practice motor skills, balance, and most of all, confidence. Now that you have some idea of what to look for, we hope you’re feeling confident yourself in deciding which climbing toy is best for your child. My favorite is the Children’s Factory soft tunnel climber. This is a great place to start and soon your child will only climb higher. A bonus is that it’s suitable for younger toddlers as well. 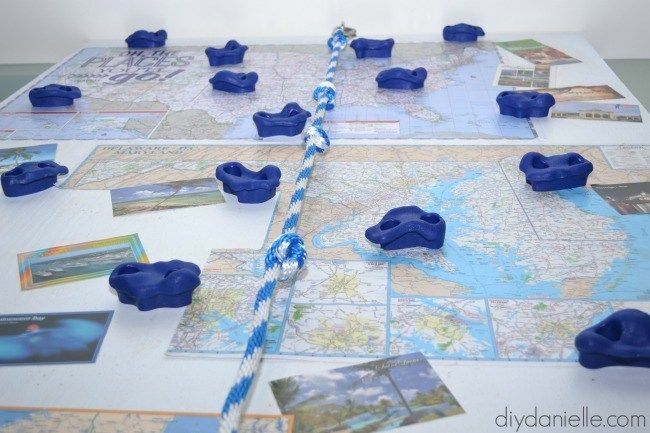 Have you tried your hands at a DIY climbing toy? Do you have a favorite from the above list? Please leave your answer below, and share our list for others to enjoy.